The Death Becomes Us Pop-Up Bar is open Oct. 11 to Nov. 4. 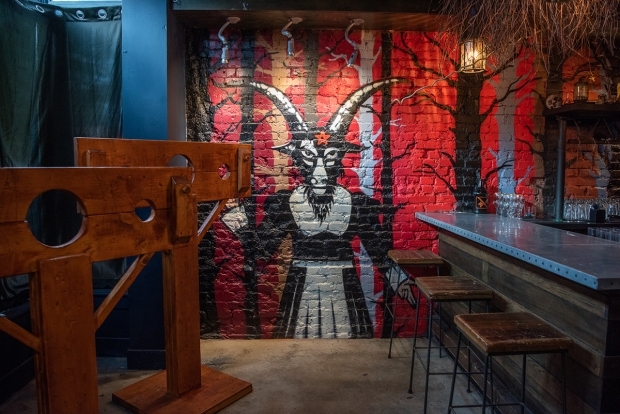 The bar's true-crime themed rooms pay homage to the Black Dahlia murder, serial killer Elizabeth Bathory and the Salem Witch Trials. You'll find the bar in Shaw, and it's free to enter most nights — except Halloween. The true crime craze has claimed another victim: This time, a Shaw pop-up bar. The Death Becomes Us Pop-Up Bar opened Oct. 11 to those awaiting a truly horrific Halloween. Dare to enter and you'll find Insta-worthy props including a bloody bathtub and stockades alongside creepy cocktails like the ouijatini ($14) and mass maple hysteria ($12). True crime tales inspired each of the bar's themed rooms. Walk through the bar's door on Seventh Street NW and you'll find yourself in Salem, Massachusetts, circa 1692, the year the witch trials began. Other rooms pay homage to the Black Dahlia murder and Elizabeth Bathory, a 17th-century Hungarian noblewoman who, according to legend, tortured and murdered hundreds of girls. Drink Company, which has transformed its 7th Street NW space into pop-ups themed around Game of Thrones and the Royal Wedding, still has a room themed for horror-punk band GWAR. You must be 21 years old and show an ID to enter. There's no cover charge, except on Halloween. Timed tickets are available for $10, with proceeds benefitting blood cancer charity DKMS.